Best Rated NordicTrack Home Treadmills – This is a roundup of the best rated NordicTrack treadmills for 2018-2019. 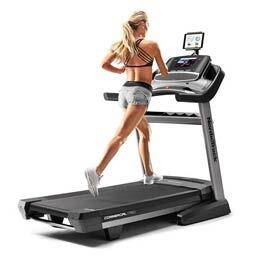 NordicTrack provides mid-range priced treadmills that are feature rich for the price. At this price range, you will get a treadmill with a larger motor, powered Incline, higher speeds available, and a larger running area. Treadmills provide an excellent form of aerobic exercise at home that you can do no matter what the weather is outside. Treadmills are easier on sensitive joints like the knees and hips, as most treadmill running areas are padded. All NordicTrack treadmills on this page are iFit Enabled, and come with a free 1 year membership. You can compare each NordicTrack treadmill below by features such as motor horsepower, maximum weight capacity, maximum speed, price, and more. A glossary of terms is available at the bottom of this page. NordicTrack 1750 Vs. 2950 Commercial Treadmills = Both of these are commercial grade treadmills. The main difference is that the 2950 has a much larger 22-inch touchscreen vs 10-inch, and the 2950 has a larger 4.25 HP motor. NordicTrack 7.5 S Vs. 8.5 S Treadmill = Both of these treadmills are similar, but the 8.5 S has a larger 10-inch touchscreen, and a larger 3.5 HP motor. NordicTrack 6.5 Si Vs. 7.5 S Treadmill = The 7.5 S has a larger 3.0 HP motor, goes faster at 12mph, has Bluetooth® Audio, has a workout fan, has a bigger incline at 12%, and a larger running path at 20×60, and has 50 workout programs vs 20. The 6.5 Si, curiously has a larger 10-inch touchscreen Vs. the 7-inch touchscreen on the 7.5 S model treadmill. Folding Treadmill = There are two type of treadmills. Folding and Fixed. A folding treadmills can fold up and roll away to another spot for easy storage. Then there are fixed treadmills, which once assembled usually stay in the same spot and do not fold up. All NordicTrack treadmills are of the folding type. Maximum User Weight = Each treadmill depending on its construction and horsepower of its motor has a maximum user weight limit. So if the limit is 300 lbs, and you are over 300 lbs., you should not buy this treadmill but look for one with a higher weight limit. If you weigh substantially less than the weight limit, this will put a lot less strain on the treadmill motor. For Treadmills under $1000 the maximum weight limit is 300 lbs. If you are heavier, you will have to go to a more expensive model over $1000. iFit Enabled = iFit is a smart fitness technology available on NordicTrack® treadmills (monthly fee). When you join iFit, you have access to many training opportunities on your treadmill , including custom-built workouts, coaching, and automatic tracking. All treadmills listed here have a free 1 year membership with purchase. Miles per Hour = This signifies the highest speed the treadmill will go when you are running. If you are a serious runner, get at least a 12 mph max speed treadmill. Incline Grade = This signifies the number of incline grades that this treadmill is capable of. Incline grades simulate walking or running up a hill. All treadmills listed have power incline, assisted by a motor. -3% Quick Decline = The NordicTrack 1750 and 2950 allows not only an incline, but also decline at a -3% grade, as if you are running downhill. Wireless Telemetry = This feature allows you to use a chest heart strap (such as Polar) to report your heart rate wirelessly back to the console. Workout Programs = Almost all treadmills have a small computer and display where you can run multiple workout programs that vary the resistance and incline of the treadmill to simulate real walking or running. Examples are programs for the heart, or calorie burn. If you subscribe to iFit, you get thousands more programs to choose from.